There are 23 Assisted Living Facilities in the Columbia area, with 12 in Columbia and 11 nearby. The average cost of assisted living in Columbia is $3,545 per month. This is higher than the national median of $3,346. Cheaper nearby regions include West Columbia with an average starting cost of $2,160. To help you with your search, browse the 164 reviews below for assisted living facilities in Columbia. On average, consumers rate assisted living in Columbia 4.0 out of 5 stars. Better rated regions include Irmo with an average rating of 4.5 out of 5 stars. Caring.com has helped 9 families in Columbia find high-quality senior care. To speak with one of our Family Advisors about assisted living options and costs in Columbia, call (855) 863-8283. Columbia is the capital of South Carolina and is situated at the source of the Congaree River. With around 14 percent of residents aged 60 or over, Columbia has a number of assisted living facilities to meet the needs of the locals. There are 23 such communities in the Columbia area, with 11 inside the city limits and 12 in the surrounding areas of West Columbia, Lexington, Gaston, Elgin and Irmo. The South Carolina Department of Environmental Control is responsible for the regulation of assisted living communities in Columbia, and ensures that facilities operate in way that ensures residents' needs and wants are appropriately met. The crime rate in Columbia is drastically higher in comparison to the rest of South Carolina and the United States. The violent crime rate is around 8.6 crimes per 1,000 residents, which is over double the national average of 4 crimes per 1,000 people. The property crime rate is also much higher than the national average at 58 crimes per 1,000 residents compared to 25 crimes per 1,000 people, meaning some seniors may not feel as safe in Columbia as they would elsewhere in the state. Columbia has a fantastic variety of activities to occupy seniors who enjoy immersing themselves in the arts. There are more than a dozen theaters and countless art galleries and installations, with many, such as The Nickelodeon, offering discounts to seniors. With an average annual high temperature of 75 degrees Fahrenheit and an average low of 52 degrees Fahrenheit, the weather in Columbia is generally mild and doesn't pose a risk to seniors with illnesses that may be aggravated by poor weather. The Columbia area is home to world-class medical facilities, including Palmetto Health Richland, in the event of medical emergencies or illness. Columbia is a member of the AARP Network of Age-Friendly Communities, meaning that its elected leadership “has made the commitment to actively work toward making their town, city or county a great place for people of all ages,” according to AARP. Columbia has an array of community resources for seniors, including Hands On Health, an organization that promotes healthy lifestyles among seniors, as well as three other senior centers. Assisted Living costs in Columbia start around $3,545 per month on average, while the nationwide average cost of assisted living is $4,000 per month, according to the latest figures from Genworth’s Cost of Care Survey. It’s important to note that assisted living rates in Columbia and the surrounding suburbs can vary widely based on factors such as location, the level of care needed, apartment size and the types of amenities offered at each community. 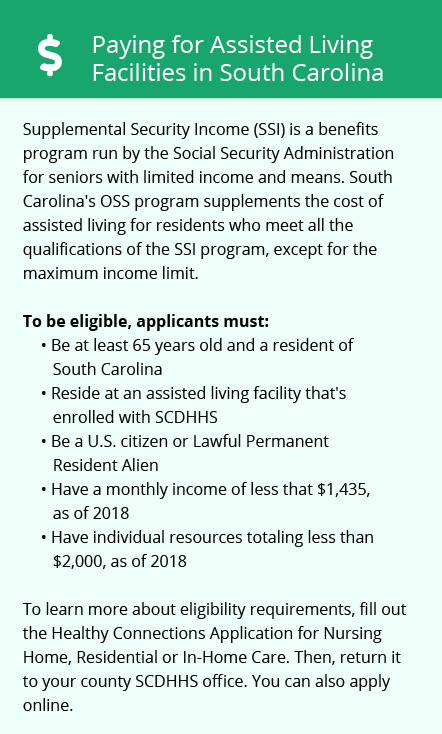 Eligible seniors in South Carolina can receive financial assistance from the state's Medicaid program, Health Connections. Columbia and the surrounding area are home to numerous government agencies and non-profit organizations offering help for seniors searching for or currently residing in an assisted living community. These organizations can also provide assistance in a number of other eldercare services such as geriatric care management, elder law advice, estate planning, finding home care and health and wellness programs. To see a list of free assisted living resources in Columbia, please visit our Assisted Living in South Carolina page. 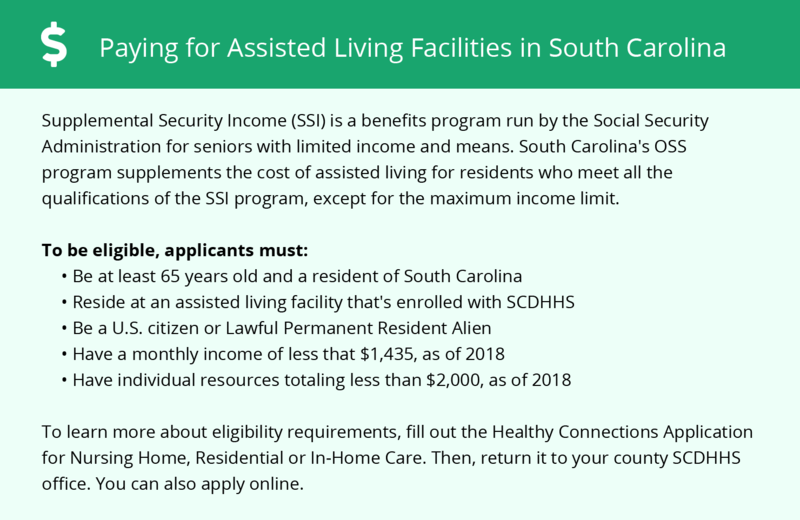 Columbia-area assisted living communities must adhere to the comprehensive set of state laws and regulations that all assisted living communities in South Carolina are required to follow. Visit our Assisted Living in South Carolina page for more information about these laws.